I met them at the gate though I usually wait inside. Preoccupied with their own thoughts, impatient, like so many children, they didn’t see who I really was. They never noticed my crown, my pain, the fire in my eyes. Like all the others they think the Maze was made for them; actually, it is the other way around. They think I am some poet who will lead them through the symbols and spaces of this Underworld. They think I will teach them lessons. They should call me Cerberus…. I am the lesson. Even I get lost. It changes–sometimes slowly, imperceptibly … sometimes suddenly. This House is not only made of stone and mortar, wood and paint; it is made of time and mystery, hope and fear. Construction never stops. I take some pride in my role as architect. They think I will guide them to the center. Perhaps I will…. ● A comparison between this image and the matching image on the cover shows that the red herring on the cover is gone and has been replaced here by the phrase “THE NEXT PAGE.” This may illustrate a principle in the book, room linkages between two rooms are red herrings. ● The door is in the shape of a pi symbol. [Independent Credit: LoMoody | Hidden Mystery | White Raven] The semicircle over the door could be visual way of expressing pi. In the book, where it says “THE NEXT PAGE”, why does the letter “A” in the word “ƿæᵹe” seem to be formed from what appears to be two hands coming together? I think it’s just the shape of an A that does it. Oh well, it is as it is. ff – Abbreviation of Latin folio (“on the (next) page”), ablative of folium (“leaf, page”). This may seem a ways out there, but I do think it relates to the matter at hand. The monstrous walls rise up and run away as far as the human eye can see, circling and dividing. Which half is the Maze? – The (circling) Colosseum has its own original shape of an ellipse. It was designed by combining two (dividing) semicircular Amphitheatres facing each other. The top basement elevation from underneath this foundation, is like a MAZE. Numerous narrow passages were utilized to lead animals to their cages (trap) or elevators, so that the main corridors (loop) remained safe and free for circulation. Most of the substructure walls follow the elliptical shape of the Colosseum, while others, however, are parallel to the major axis. Corridors were running uninterruptedly round the building, behind which again is another precisely similar corridor. Passages (path) throughout these corridors would lead to lower levels and upper balconies. 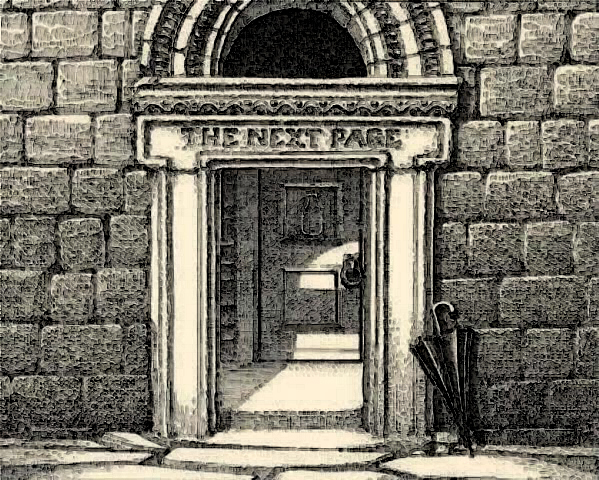 Considering the attention to detail in the book, another odd new thing I noticed is that the door handle visible inside the gate (belonging to the door to room 41) overlaps with the inner edge of the gate, throwing the perspective all off. If you have the book and look closely you should be able to see what I mean. I haven’t extrapolated any meaning from this, though, other than a sort of M. C. Escher -style bending of space which fits into the guide’s comments about time and space constantly changing the maze. It’s also interesting to note that there are 8 complete layers of blocks, from top to bottom. Block + 8 = Blockade. And the definition of a blockade is an act or means of sealing off a place to prevent goods or people from entering or leaving. Which, in fact, the guests are. Since Manson has confirmed that the Guide is the Minotaur I’m confused as to why he calls himself the architect here. In the Myths of the Minotaur and the Labyrinth it is Daedalus who designed and built the Labyrinth. There’s a lot to recommend Daedalus as the guide, and references like this one are the reason that the Minotaur wasn’t simply assumed to be the Guide decades ago. We now have back-channel communications with Manson informing us that it’s the Minotaur after all, but no further word on why this version of the Minotaur is a literate, eloquent architect who apparently doesn’t look enough like a bull to cause his guests any alarm. @vewatkin I don’t mean to brag, but I do very much appreciate everyone’s feedback, in all of this. Thank you, once again. Could the Minotaur also be the Mediator betwixt Man and God? It seems unlikely that there’s much of a multi-layered, theological significance to Maze. It seems to be mostly wordplay, set in an ominous atmosphere with some clues (foreshadowing, in a sense) as to the Guide’s evil nature and identity. That said, the prologue does a lot to suggest the nature of the Maze is enigmatic and that it exists in some different kind of world, and it’s not clear whether this is just vague, atmospheric description, or meant to be part of a series of clues from which we could deduce the location or purpose of the Maze. I do think that to the extent you’re looking to discern the nature of the Maze and the Guide, you should be looking to insinuations in the text, and any puzzles you can find that indicate something along those lines. (I’m not sure any such puzzle has been found.) It seems unlikely that Manson intended to establish some major aspect of the characters or setting without including textual support (whether explicit or through riddles). “Preoccupied with their own thoughts, impatient, like so many children, they didn’t see who I really was.” – Are the impatient children more closely related to, as being daimonic personifications? Socrates thought the daimones to be gods or the children of gods. “Like all the others they think the Maze was made for them; actually, it is the other way around.” – A place built for spirits to keep them from wandering aimlessly? We think the guide and the architect could also be an obversified deification of a shoulder angel. He’s the Minotaur, it turns out! There are several clues to this in the book, and Manson seems to have confirmed his identity in some way. Evolution of Theatron – Mime crown, mime paint, the fire in my eyes(stage lighting). Interesting take on it. I always assumed “pain” referred to his colostomy bag. Could it be that the umbrella stands for an exertion of influence from a protective force? @vewatkin Thanks for the constructive criticism. When it says “They think I will guide them to the center.” Could the word ‘center’ be referring to the word “centaur”? It’s a good idea, but I just checked, no centaurs in the book. It’s too bad, if there were even a single centaur in the book this wouldn’t be a frivolously insane suggestion. What if by “maze” he meant “maize”? That’s roughly the color of the room backgrounds. I think “The Gate” in question is actually related to “The Gate Control Theory Of Pain” and the interconnectivity between all of the neural senses. The illustrations of this theory look exactly like the guided maps that intotheabyss.net has provided. In regards to where it says “They never noticed my crown, my pain, the fire in my eyes.” – Does this refer to the story of “The Stonecutter”? The analogy of the crown, is that of the stonecutter wanting to be a king. The pain that the golden umbrella brings to him from the light, by tanning his skin. And the fire in his eyes, from becoming the sun? Quit playing around and get your head in the game. You see those two little unusually round stones to the right of the doorway, like a little dot-dot? Yes, that is a Morse code I. The “circling and dividing” part of the text, together with the half-circle above the pi-shaped doorway, seem to be a reference to how you arrive at the irrational number pi: divide the circumference of a circle by its diameter. You have rise and run in the text, and a nice little sine wave on the gate as well. In the book ‘L’alphabet grec’, T. H. de Mortain speculates that letter П is a gate, since it is the first letter of “πύλη” (gate of town or temple). The equation for the circumference of a circle is 2(pi)r.
So the equation for half the circumference of a circle, represented by the semicircle over the gate, is (pi)r. Hmmm… could the handle of the umbrella be an “r”? Since Mortain’s belief was based in part on the fact that П looks like a gate, there’s nothing surprising about finding a gate that looks like a П. Here too the door makes a pi symbol. I had a thought about the whole Cerberus comment, which has always seemed to me to be completely weird and inexplicable. 1. He IS some poet who will lead us through the symbols and spaces of the Underworld. 3. He IS the lesson. He’s basically just being a smart-arse. I think the words “I am Cerberus” are a metaphor. What I mean is, I totally agree with you. The poet guiding us through the Underworld, is that a reference to Inferno? Dante’s guide through the Underworld is Virgil in The Divine Comedy. Kind of sets the tone. Just looking closer at the text, the guide describes the circling and dividing walls, then asks “Which half is the Maze?” Confusing, I am not really sure where to go with that, but I have a feeling it is a huge clue. Also mentioned later in the book is that there are “190 doors in this part of the Maze”. 190 is a clue, but “in this part of the Maze” catches my eye. Referring to The Path, The Loop, The Trap or talking about that half of the Maze, as said in the Prologue? Also, the narrator makes a point of saying that the sun was hot. Said sun was also mentioned on the next page, Room 1. Sun symbols are also seen throughout the Maze (also called House, based on which room you are in), and the word Sun is also found in the maze blueprint on the title page. I realize the futility in responding to this three years later, but… I was also wondering about the “which half is the maze” question. We don’t know what’s on “this” side of the Maze, the side the story begins on. It makes me wonder if the implication is that whatever’s on the side we start on could also be thought of as a maze. Which side is in and which is out? The story either gets you back to where you started, in the hot, glaring sun, or ends up in a doorless place of unlimited darkness. Is either one really a destination? I always assumed room 24 was a trap, but I’m not sure escaping out to room 1 is any different, really. In that same paragraph the narrator says the walls circle and divide. Circle what? Divide what? Can you circle and divide at the same time? It could stand for “Difficult to understand”. If not, the it looks like Pi, an endless path, numerically. Slight note – near the text “center of the Maze” we have “I will” twice. Both things found in the center room 45.